Swedish Tree Done in 50 Days! Well, here I am at the top of the tree, and I'm really amazed at how much I have learned in such a short amount of time. I just wanted to thank the Swedish moderators and users for being extremely helpful and always answering questions when they arose. This course has been really amazing. Thank you very much for giving us the opportunity to learn this beautiful language! Congratulations! :D I agree with you that the course is amazing. The more I study Swedish, the more I love it! Did you start when it first came out? I have lost track of how long it has been. I miss having an individual streak for each language. I started a week or two after it was released, I think. Oh wow! You were flying! I started the day it came out. I have, um, I think six more or seven more skills left. I'm on the rocket ship...so, future perfect. Congratulations CrazyChao! I can't wait to finish my first tree. Tack :) Good luck! Which are you going to finish first? Of course! They were the highlight of my afternoon. Right after dinner and the cats, that is. Tack :) I definitely recommend it! Being in beta, it's still a tiny bit rough, but it's still very good. Congratulations!! How long did it take you to go through and how good are you speaking it now? It took me fifty days. I didn't do much work for a week around Christmas, so I probably could have finished faster if I had really wanted to. I'm not trying to discourage you; my reading and writing skills are very good and still steadily improving. By the time you're finished with the course, I'm sure you'll be very good at it as well. Do your best, though, to find someone who speaks Swedish and talk with them to improve your speaking and listening skills. Wow really nice! I started two weeks ago, but I have a decent sized vocabulary. It's just the grammar that gets me, and of course some of the really weird rules, if you can even call them that. Since I work in Swedish and have lived here for 2 years, I'm sure it's different because I always hear the language- no excuse for me not being fluent by now ; ). There are plenty of conversation/language exchange sites if you ever wanted a Swede to speak with! : ) Best of luck with everything and thanks for the quick reply. What is it about the grammar and rules that confuse you? I might be able to help. Do you know of any sites like that in particular? 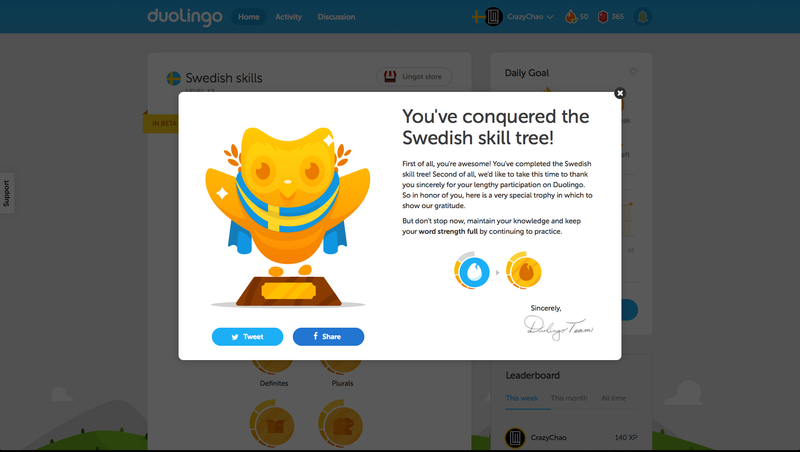 Finished the Swedish tree in 5 days! It only took 154 days! finished my Swedish tree in 54 days! yey!